During the Civil War, many “war widows” had to keep farms running efficiently, raise children, and keep business going until their husbands return. 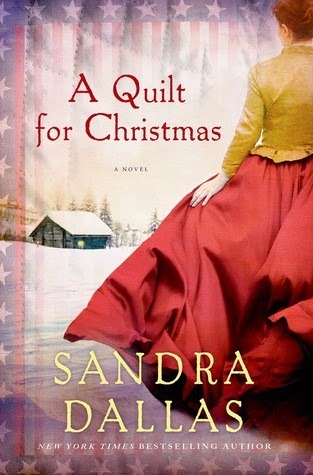 Eliza Spooner is in this exact situation in A Quilt for Christmas by Sandra Dallas. While her husband is away, Eliza becomes dependent on a small group of women for support and fellowship. Quilting, of course, is one way these relationships are developed, and a quilt is central to this story. Eliza has made a Stars and Stripes quilt that she entrusts to another soldier to deliver to him—along with some of her homemade divinity. She imagines Will finding comfort in the memories of home, even as she awaits his infrequent letters to her. In the meantime, Eliza befriends a local girl named Missouri Ann. Missouri Ann has married into the meanest family in the community. Her husband, Hugh Stark, has died in the war but Missouri Ann is still living with the family. While she loved Hugh and claims that he was nothing like his family, she is still in a tenuous position. The Starks are insisting that she marry Hugh’s one-legged brother and remain with them. Seeing only a live of servitude and wretchedness, Missouri Ann decides instead to strike out on her own. She goes to Eliza and asks whether she might stay and help out on the farm. Missouri Ann, a spunky and colorful girl, is a welcome help at Eliza’s home. The two women also encounter a runaway slave and brave the forces around them to see her to safety. Between quilting, raising children, supporting one another, and working on the farm, the two women develop an endearing relationship. A Quilt for Christmas is a charming novel of life during a difficult time in history. It is a testimony of love, friendship, and courage. With some developments in the war and at home, the ending is a satisfying conclusion to a heartfelt book.